• Boys' Treasure Box "Jumbo Size" is designed for brothers of sisters who love their ballerina music box! • Every kid needs a special box for special treasures! 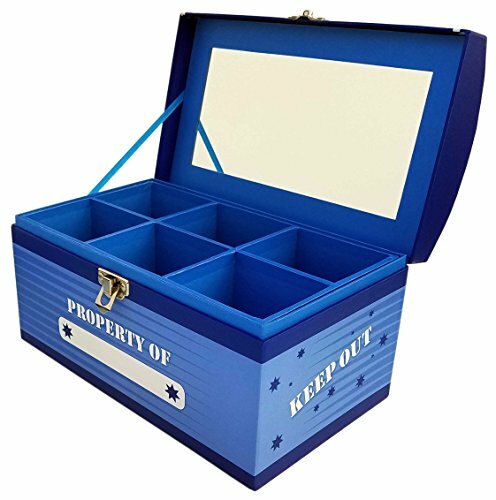 • My Tiny Treasures Box Company created this awesome box in Jumbo and Junior sizes for kids to keep their toys, cards, cars, rocks, and other treasures safe and organized. No more lost Pokemon, Minecraft or other trading cards! • Specialized storage compartments are designed to hold trading cards and other items. • Larger items including children's watches, necklaces and bracelets can be placed in the larger, open area beneath the removable tray. • The box is constructed with durable, rigid 900gsm cardboard. • The Jumbo size includes a glass mirror and both sizes have a ribbon connected lid. • Snaps closed with a silver-colored metal latch. • Warning: Choking hazard. Includes small pieces. Not appropriate for children under 3 years of age. • The lift out tray is great for storage of larger toys, collections and treasures! • A great look for kids room decor! An awesome desk organizer for boys' treasures and Top Secret items! Pokemon or other trading cards, rock collections, Matchbox or Hot Wheels cars all fit easily and can be organized! Write your name on the front panel and list the box contents on the back panel. Mirror inside and big metal latch for small fingers. Lift-out drawer has 6 sections. Lower storage area can hold and conceal larger toys and collectables.. If you have any questions about this product by My Tiny Treasures Box Co., contact us by completing and submitting the form below. If you are looking for a specif part number, please include it with your message. Slap Bracelets, 35 PCS Birthday Party Favors Gifts (25 Designs Slap Bracelets + 5 Reversible Sequin Mermaid Bracelets + 5 Silicone Emoji Bracelets), Charming Wristband for Kids and Adults.